Dr. Charles Perry adds innovative cellulite reduction treatment Z WavePro to his selection of non-surgical procedures as a stand-alone or multi-modality option for patients seeking smoother skin. Sacramento, CA — A harmless condition that affects as many as 90 percent of women and around 10 percent of men, cellulite can be a bothersome cosmetic issue for millions of people. 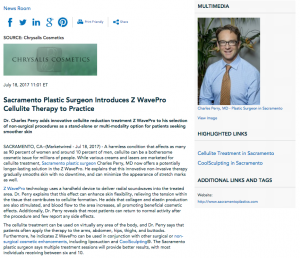 While various creams and lasers are marketed for cellulite treatment, Sacramento plastic surgeon Charles Perry, MD now offers a potentially longer-lasting solution in the Z WavePro. He explains that this innovative non-invasive therapy gradually smooths skin with no downtime, and can minimize the appearance of stretch marks as well. Z WavePro technology uses a handheld device to deliver radial soundwaves into the treated area. Dr. Perry explains that this effect can enhance skin flexibility, relieving the tension within the tissue that contributes to cellulite formation. He adds that collagen and elastin production are also stimulated, and blood flow to the area increases, all promoting beneficial cosmetic effects. Additionally, Dr. Perry reveals that most patients can return to normal activity after the procedure and few report any side effects. The cellulite treatment can be used on virtually any area of the body, and Dr. Perry says that patients often apply the therapy to the arms, abdomen, hips, thighs, and buttocks. Furthermore, he indicates Z WavePro can be used in conjunction with other surgical or non-surgical cosmetic enhancements, including liposuction and CoolSculpting®. The Sacramento plastic surgeon says multiple treatment sessions will provide better results, with most individuals receiving between six and 10. Dr. Perry says he has added this non-surgical skin enhancement therapy to his practice to help cater to a need that many patients, including both men and women, have. He says cellulite can be a source of self-consciousness and cause individuals to alter their clothing or activity to avoid revealing areas affected by this concern. With the Z WavePro, Dr. Perry says patients can now address this issue without the discomfort of surgery and with results that last for many months. A board certified plastic surgeon and Medical Director of Chrysalis Cosmetics, Dr. Charles Perry provides a comprehensive range of aesthetic treatments to individuals in the Sacramento, Modesto, and Stockton area. He earned his undergraduate degree from the University of Puget Sound and his medical degree from the University of Washington. After completing additional training in Arizona and Massachusetts, he achieved status as a Fellow of the American College of Surgeons and as a Diplomate of the American Board of Plastic Surgery. Dr. Perry is available for interview upon request.